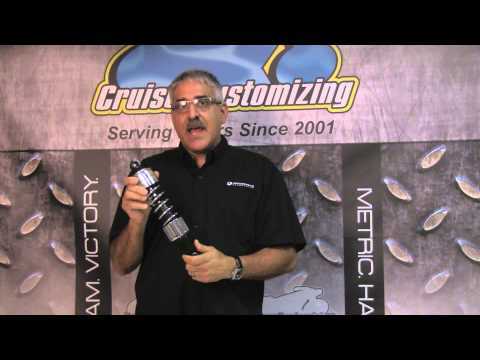 The 412 Series shocks are simply the best value shock on the market today. The 412s simple, durable design means they will be an improvement to your motorcycle's suspension performance for as long as you are riding it. The doublewall steel body construction with nitrogen charged, multi-staged velocity sensitive valving gives you smooth, consistent damping. A five-position cam style preload adjuster lets you dial in your ride whether you're a light rider or heavy hitter. With multiple options like full show chrome or black covers, chrome or black springs in progressive rate, Standard or Heavy-Duty for most applications, there is sure to be a 412 that's right for you and your bike. Heavy Duty Applications are recommended for riders that are 250lbs or more or for riders who ride 2 up over 50% of the time. Before purchasing longer than stock shocks, confirm that your wheel travel can be extended without causing clearance issues such as, swingarm/axle to exhaust contact as well as chain/belt guard contact.